This weekend the Canadian National Championship will occur, and it will be the largest tournament played in the post Trump Card format before the US National Championship and will give us our best peek into the upcoming meta game that we will be playing in. 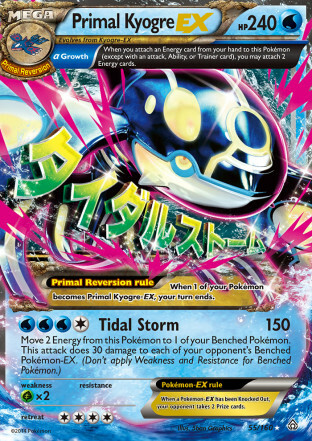 One deck that I think could have some surprise success at the tournament is Primal Kyogre EX. There are some more decks that saw play at the previous National Championships, but these appear to be the main decks of the format that we should play against more often than other decks at the upcoming two weekends of National Championships. As predicted, the format began with Night March and started to develop around it. A lot of the top decks that saw play such as Landorus EX/Crobat PHF, Donphan PLS, Trevenant XY/Gengar EX, and Seismitoad EX/Crobat PHF all have some pretty strong matchups against it. While Night March isn’t lacking in raw power, decks with supplemental damage, snipe damage, and Item lock can all cause major issues for Night March. While it’s too early to write Night March off, it wouldn’t be too crazy to see Night March see a decline in play as players don’t want to bring the deck into a tournament that provides a hostile environment for the deck. If Night March begins to see less play starting with Canadian Nationals that will open up the meta game for a shift which will allow some new decks to break into relevancy. 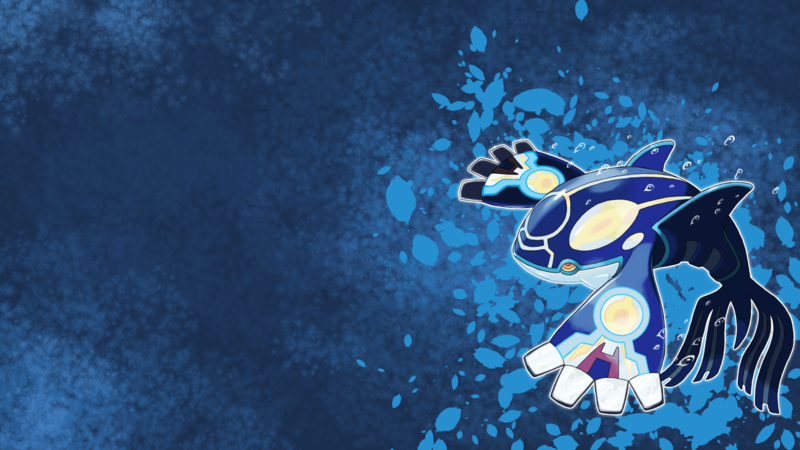 This brings me to my sleeper pick for Canadian Nationals – Primal Kyogre EX. Primal Kyogre actually had its coming out party during State Championships taking down a Provincial Championship during the first weekend of the tournament series, so it would only be fitting for Primal Kyogre to put in a big performance in Canada. I actually played Primal Kyogre EX in a cash tournament played in the best of 3 format in preparation for Nationals. The tournament was fairly high quality, with five Worlds qualifiers playing in the tournament. I finished 3rd in the tournament, losing to Seismitoad EX/Crobat PHF in Swiss for my only Swiss loss, and then losing to the same 60-card list, although a different player piloting it, in Top 4. While it was disappointing to lose and finish in a lesser prize slot, I was able to see that I unintentionally made the Seismitoad matchup worse than it should be with some of my card choices in the deck, making adjustments in my current list to make the deck better suited against Seismitoad EX and cutting out some of the fat. I will start by going over the cards that I cut from the deck, and the logic behind playing them. Depending on how the meta game shakes out after Canadian Nationals, some of these cards are cards that might be put back into the deck. 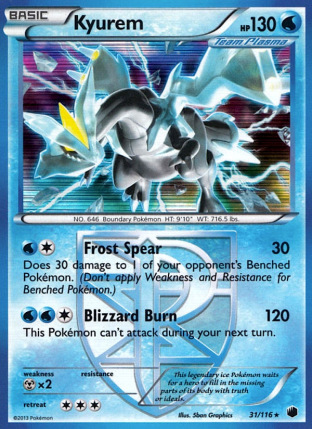 The first card I cut was Kyurem PLF, which I played in the deck to give myself a clean OHKO on Safeguard Pokemon. Safeguard didn’t end up being very popular at the tournament I was in, so I don’t think it’s worth teching specifically for and Suicune and Articuno can both knockout Safeguard Pokemon for you if you’re in a pinch, otherwise you can just Lysandre around it. The next card I cut was Iris, which was a last minute addition that would allow my Primal Kyogre EX to hit a damage numbers to OHKO some EX’s after my opponent took a few prizes. The problem is you often find yourself needing to play some other Supporter during your turn and against Seismitoad EX decks you can’t VS Seeker for it anyhow, making it difficult to have it when you want it. I put an Absol ROS into the deck in its place, which lets you move 3 damage counters from one of your opponent’s Pokemon to another of their Pokemon. If you spread 30 to some benched Pokemon you could then move it to the Active to get the psuedo-OHKO that way. The next two cards I cut were a Professor Letter and an Energy Retrieval. These cards are good in general, but against Item lock decks they’re dead. I used the 3 non-Iris cuts to just put in three more Energy cards. 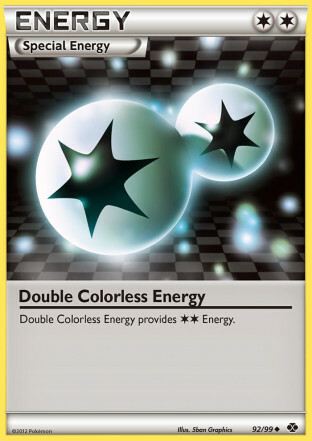 I put an emphasis on bulking up the Double Colorless count to three as they help you power up Suicune more consistently and could be played on a Primal Kyogre EX to work around a Head Ringer. While the Energy grabbing Items are nice, I think you should generally be able to get two Energy in your hand at the same time often enough playing such a high Energy count. For the most part, this is a fairly standard Primal Kyogre list. 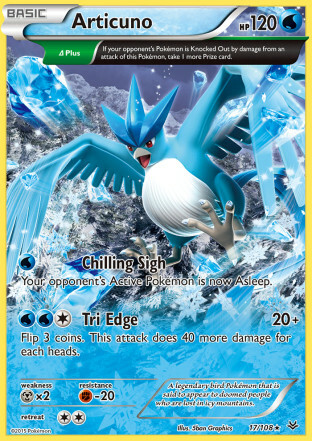 The most interesting card in the deck is Articuno from Roaring Skies. Articuno has the Plus Delta Trait which allows it to take an extra prize when it takes a knockout. This can help you gain a positive prize exchange against a non-EX deck like Night March, and Primal Kyogre EX also doesn’t OHKO EX’s, so you can use Articuno’s Tri Edge to finish off an EX for three prizes. Articuno isn’t the most consistent card, but you only need to flip 1/3 heads on Tri Edge to knockout anything with less than 60 HP. I wouldn’t depend on it for anything more than that, but sometimes you get forced into situations where you only can win the game if you get lucky on Tri Edge flips and sometimes you will hit the 2 or 3 heads you need and luck sack your way into additional wins. Articuno also has a first attack, Chilling Sigh, which puts the Defending Pokemon asleep for a single Energy. This attack can break Seismitoad EX’s Item lock for you, as well as make your opponent lose some turns to sleep in many other matchups. 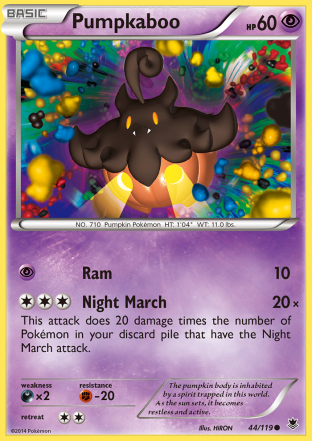 Against the Night March deck I played this past weekend, after getting a clunky start in the second game of the series, I was able to keep a Pumpkaboo asleep for two turns with Chilling Sigh which gave me the time to get some Primal Kyogre EX setup and take control of the game. I play Ultra Ball to allow for the use of Shaymin EX. I think this is really important for the deck (and most decks in general) to play something like this as it increases the number of positive turn 1 outs to draw increasing the consistency of the deck. I’m unsure of whether Shaymin EX or Jirachi EX is better in this deck, but I think Shaymin EX is probably better in this deck because it can pick itself up off the field which could save you some games that you would otherwise lose from having an easy two prizes on the bench. You do play Safeguard, so against EX heavy decks, you can N your opponent to a low hand size, use Sky Return into Suicune, and then more often than not your opponent won’t have in hand the means to work around the Suicune. Then you next turn you can play down the Shaymin EX to draw into the cards you need. Lastly, I don’t think Mega Turbo is all that great in this deck. I don’t think you can fully commit to the card in this deck as then your Item lock matchup becomes very negative, and at the lower numbers it wasn’t doing much to speed up my turns of attacking. I think the deck is probably best played with a focus on getting up and swinging turn 3 and just focus on maintaining attacks for the rest of the game once you get the first Tidal Wave setup. I haven’t explored it personally, but you could potentially try playing a version with Archie’s Ace in the Hole to go for a turn 1 Primal Kyogre EX setup through Mega Turbo, but I would think such a deck would be too inconsistent to survive a tough tournament such as a National Championship. In this section I will briefly go over the matchups for the deck against the decks listed above. Based on my view of the matchups I hope you are able to see why I believe Primal Kyogre EX has a shot to be a good sleeper deck for the Canadian National Championship. Night March – This matchup went from one I lost most of the time to one I started to win a decent amount of the time, so I think overall it’s probably a fairly even matchup. The issue Night March has with the deck is that they really need to overextend to be able to OHKO a Primal Kyogre EX. They would need 11/12 Night March Pokemon in the discard pile to OHKO a Primal Kyogre EX, so any prizing of Night March Pokemon prevents this from happening. Therefore, any time you have a Primal Kyogre EX setup, Night March is taking 2HKO’s on you, which lets you prize trade fairly favorably. In this matchup you have to be careful about what you bench so there aren’t a bunch of free prizes for your opponent to drag up with Lysandre and you want to focus on getting out as many Primal Kyogre EX as possible. 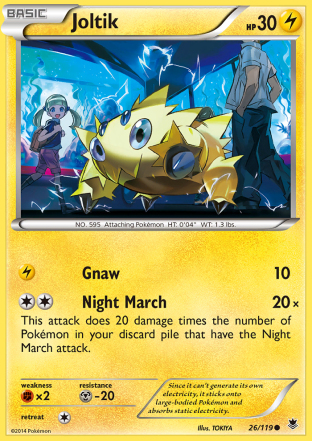 Even if you bench extraneous Pokemon on your bnech, Night March will often need to play a Supporter to fish for Energy to attack anyhow, which can protect your benched Pokemon from being knocked out as well. Interestingly enough, you can create situations where you trade 2 prizes for 3 or even 4 prizes with this deck. Night March takes 2HKO’s on your Primal Kyogre EX most of the time. You take OHKO’s on everything, so if you can chain Lysandre on their EX’s (or they have to attack with Mew EX) you can take two prizes on those turns. You have 4 Rough Seas, so you can counter Dimension Valley fairly well. Night March plays a much more aggressive draw engine than this deck, so they are more likely to have to discard a Dimension Valley early letting you win the Stadium War. You then have Articuno in the deck which can stall you some turns early game, and can let you jump ahead in the prize trade later in the game. This isn’t the matchup I would want to see much of at a tournament with this deck, but with enough practice, you can turn the matchup into one you win a fair amount of the time. Landorus EX/Crobat PHF and Donphan PLS – Both of these decks are reliant on 2HKO’s and 3HKO’s, and you hit both decks for weakness, which allows you to take knockouts fairly easy against both decks. With Rough Seas you can heal off a lot of damage in these matchups to make taking a knockout against you a long, arduous process. Both of these matchups are extremely positive for the deck. Primal Groudon EX – This matchup is very weird, and can go either way, but it’s generally in Primal Groudon’s favor if all draws are equal. It’s highly dependent on which player is drawing better in that game, and there is a lot of variance in this matchup as both decks can have a tendency to be clunky at times. 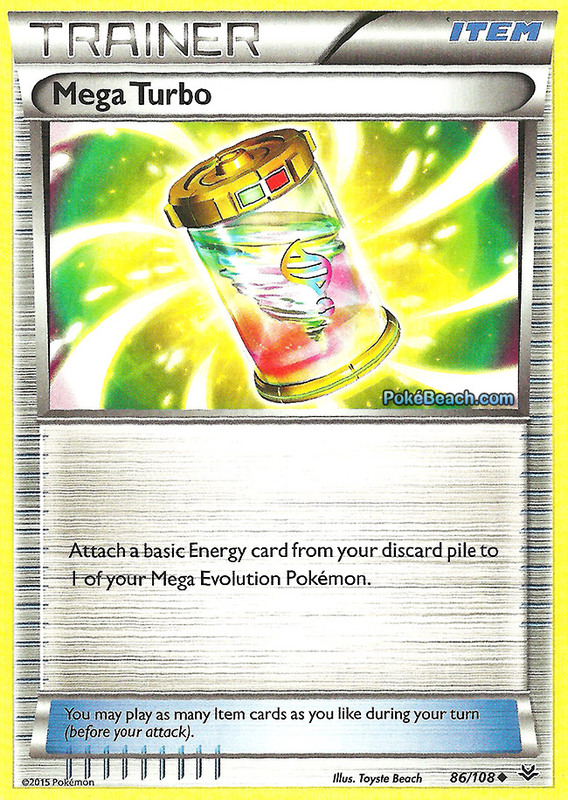 Kyogre has the benefit of spreading damage to benched Primal Groudon EX to shutoff their Focus Sash, and since it moves Energy off, it can conserve Energy to maintain attacking against a Primal Groudon EX deck. Kyogre does a good job of putting pressure on Primal Groudon, but you need three Tidal Wave snipes before a Primal Groudon EX will get OHKO’d, so if the Groudon player gets a fast Primal Groudon setup with Mega Turbo you will just always behind in the prize trade and lose. 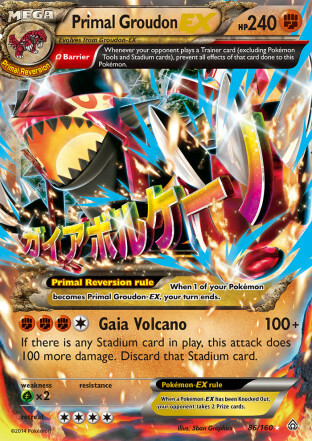 Trevenant XY/Gengar EX – This is a near auto win for your deck, especially if you can land a Float Stone on Keldeo EX during the first turn of the game. Rough Seas is just too good against this deck, removing Trevenant’s snipe damage, and turning Tree Slam and Dark Corridor into 4+HKO’s while you will mostly be taking knockouts any time you attack. What also really helps this matchup is that Lysandre can be used to break the Item lock allowing you to do stuff like get a Float Stone onto a Keldeo EX, even after you had already been Item locked in the game. Seismitoad EX/Crobat PHF – As mentioned early, this matchup made up all of my losses in the tournament, and was very much a bad matchup. The issues I had with the deck were missing turns of double Energy attachment, as well as not getting a Float Stone on Keldeo EX during the first turn of the game. In my losses, I was just missing too many turns of attacking to pull off the win. With an increased Energy count and less dependency on Energy grabbing Item cards I think the Toad matchup should be quite a bit improved. The key to winning this matchup is to get a Float Stone on Keldeo EX early and simply not miss your Energy attachments so that you’re attacking most of the turns of the game. Even if you don’t get a Float Stone on Keldeo EX right away, I think playing a higher Double Colorless count will give you better options for having a Keldeo EX Rush In Retreat into a Primal Kyogre EX. 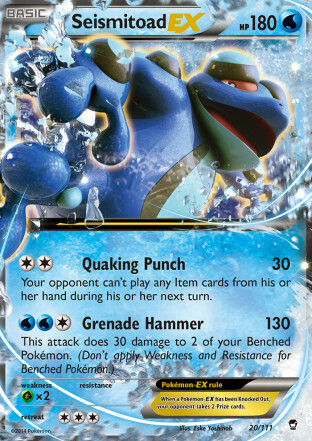 Look out for opportunities where it is beneficial to you to leave their Stadium Active to be able to keep 30 damages on other Seismitoad EX (they can use Rough Seas to heal their Seismitoad EX too) to create potential situations where you can take four prizes in one turn. I think my biggest issue in this matchup at the tournament I played against in it is that I didn’t play enough Energy to consistently hit two at a same time, and I think adding three more Energy should greatly improve the flow of this deck under Item lock. M Rayquaza EX/Bronzong PHF – I think M Rayquaza EX should win this matchup almost every game. However, I have seen some iffy M Rayquaza lists online that I have been able to pick up a lot of wins against, so if you’re playing against a shaky player playing M Rayquaza you might be able to pull off some wins if they can’t draw into a Sky Field again after you bounce it with Rough Seas. So against bad players, you may be able to pick up some wins, but against any good player playing the deck I think you will get blown out. Raichu XY/Crobat PHF – This matchups has been fairly positive in my testing. They have a lot of difficulty taking a OHKO on a Primal Kyogre EX and Rough Seas can heal off most of the Crobat damage they use to try to setup KO’s. 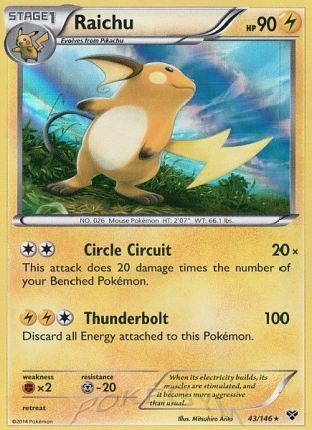 Raichu definitely has the potential to win if they can use Lysandre effectively to bring up non-evolved Kyogre EX’s, but most of the games I’ve played against Raichu decks I have won comfortably. A wildcard in this matchup is if the player somehow managed to fit in a few Leafeon. if they play Leafeon, then they can score a OHKO on a Primal Kyogre EX if you put too much Energy on the field. Aromatisse Tool Box – I haven’t tested this matchup more than a few games because it’s not that popular, but it did Top 8 two of the foreign Nationals last weekend so I made sure to include it in the list of decks that will create the primary focus of the meta game. From a pure theorymon perspective, Trevenant EX would need three Rainbow Energy and a Muscle Band in order to OHKO a Primal Kyogre EX which would require a lot of resources devoted to that one card to pull off the OHKO. How I would approach the matchup is to clear the opponent’s field of Aromatisse with Lysandre, and once they’re out of Aromatisse they would have to discard their Energy on a Pokemon to heal it allowing you to either lock in knockouts or force your opponent to discard their Energy, both of which are favorable outcomes for you. If played properly, I think you will win this matchup most of the time. The one area where I would be a bit uncomfortable with the deck is that the deck has a slow tempo (starts attacking turn 3) and can be clunky at times which could spell doom in a best of 3, 50 minute format. While it probably doesn’t have the speed to complete three games too often, it does offer some of the best legal stalling ability with Rough Seas and bulky Pokemon which could be used to prevent your opponent from being able to take six prizes to finish off a game 2 after you won the first game. However, as we can see from TJ Traquair’s and Kevin Baxter’s success during State and Provincial Championships with the deck, it can obviously succeed in the tournament format. With some fairly strong matchups against some of the most hyped decks and survivable matchups against most of the other top decks I think Primal Kyogre EX has the potential to have a big weekend in Canada.